BEFORE: After a heart-pounding episode of Breaking Bad filled with mysterious bacon, a not-so-dead Ted, and magnets, it’s time to return to watching some movies. I can think of no better way to commemorate the end of the San Diego Comic Con then watching a superhero movie. AFTER: I was never a comic book fan as a kid. For whatever reason it was never appealing to me. Nowadays, there’s superhero movies coming out every year and I enjoy them for no other reason than being able to partake in some fantastic stories and characters I don’t know that much about. When I saw The Avengers earlier this year, I thoroughly enjoyed it. I thought it was very well done and but there were some things I didn’t fully understand not having seen all the prequels. Thor sheds some light on some of the mystifying parts. You find out more about Thor (Chris Hemsworth) and Loki’s (Tom Hiddleston) relationship and why Loki hates Thor, what makes Mjolnir (the hammer) so special to Thor, and lots of background info on Dr. Erik Selvig (Stellan Skarsgard) who leads the Tesseract research. The Thor universe (characters, worlds, weapons, transportation, enemies, allies, etc.) is vast and highly detailed. Kenneth Branagh does a great job portraying this great wealth of information to a first-time viewer very effectively. I didn’t find myself confused by the heavy plot and the visuals of Asgard and Jotunheim were just breathtaking. While I understand Thor’s banishment to Earth is a very key part to this story (it’s the main character’s conflict), I couldn’t help but want more of Asgard. 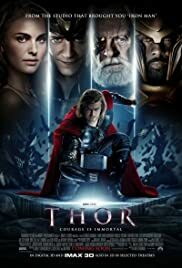 Earth doesn’t appear until thirty minutes into the film and even then you continue to go back and forth between Asgard and Earth. It felt to me that the Earth part of the story was thrown in as an afterthought compared to the Asgard side of the story. I may get sick of all these superhero movies two or three of them being released each year, but for now, I find them highly entertaining. Not only are they visually attractive and contain great action scenes, but they also have great stories with highly detailed characters. Seeing Thor makes me want to see the sequel just to get another look at Asgard.